If you couldn't get to El Mello, particularly on Saturday when El Mello closes, P&F Coffee is the next best thing Indie cafe in Bangkok can offer. The location is very convenient and easily accessible via BTS at the Victory Monument, not that far from tourist's locations. Before the advent of El Mello, this was the place I recommended for people to drop by for a great cup of coffee in Bangkok with its house espresso blend. IIRC, it had a nice body with some chocolate aftertaste. The Capp was also great too. However, P&F Coffee is actually not only a cafe but more of the company that represents quite a few famous espresso related things including Reneka, Orchestral, Eureka, Olympia cremina and lots I couldn't remember. P&F also organizes GBC in Thailand too. The location is quite convenient and within reach/accessible of BTS skytrain at Victory Monument station. Let talk about milk drink first even though I had this the last. I really like the latte art a lot as it's quite soft and nice vs. those "aggressive" pattern with lots of layers sometimes I think the barista tries a little too much it's out of touch with customers. This one looked more homey, warm and nice. Great job! About the drink, the capp was made by its 90 point coffeereview.com Splendid Blends. As the coffee is roasted once a month, you need to make some reservation to try this coffee. The espresso machine was Orchestrale and the grinder was one of the top level from Eureka. Now, the main reason I drop by. This was one of the espresso pulled by Khun Sirada using the 90pt Splendid blend. I remembered quite a complex tasting profile with the first sip which was quite interesting already and the coffee was at its fourth day after roasting. Of note is again the color of the crema. The crema was light brown and I saw the blonding toward the end of the shot which seemed to be typical in Bangkok’s cafe; they don’t want to waste any single drop of coffee. I can only wonder how it will be if they pull it shorter. This was also the experience a barista from one of the respected shop in HK had during his trip to Thailand. He just instructed the barista at a kiosk in Siam Square to pull the coffee shorter and the taste improved tremendously. I trusted this barista for his tasting note so please try to tell barista in Bangkok that quantity is not what good for coffee. It's where the sweet spot is that is more important. Anyway, the whole experience was quite enjoyable that afternoon Khun Sirada gave me some time to talk coffee and I like to thank her for her courtesy shown during my visit. I repeated my experience with Splendid in Hong Kong, expertly pulled with GB5 + Super Jolly. The first thing I notice is the color of the crema which, to me, is a much better looking and less volume which allows the coffee to showcase itself much better, a repeatable style I enjoyed with coffees at great Indie shops in Hong Kong over and over again. The coffee was amazing in a sense. It was roasted quite dark for me but managed to show all the complex tasting notes which is definitely a great achievement. To me, one usually tastes mostly the roast profile with this level of roast which typically covered all the nuances in the coffee. I recalled talking to Khun Sirada that she admires the very complex tasting notes of coffee from Italy and this blend was spot on for what she described. With lots of tasting note like this, it should hit every point on the score sheet so there’s no wonder the coffee score well and should score very high in any review. However, to me, it couldn’t escape one of the pitfall of the dark roast. All of the tasting note seemed to be enveloped by big round body or something like that. It does not stand out well like Indie's blends which are in fashion these days. There’s also some comment that the coffee did not taste clean which, in a way, should be quite difficult for this blend to achieve with this kind of dark roast level. In all, I think the design of this coffee fit very well the classic/traditional taste profile and was very complex coffee. Think great coffee from the continental Europe. It’s not my cup of tea as I prefer something lighter in roast with a more salient tasting notes. The coffee will need to find its audience that really loves dark roasted and complex coffee which I can’t think/currently know of anybody around me at the moment. Still, one should try to see whether this is what one looks for in the coffee and may serve as a good diversion from the one two punch tasting notes with no memorable after taste Indie café seemed to love to blend these days. As a conclusion from posts over the past four days, coffee lover will be astound from the sheer number of cafes in Bangkok, even in a cart on the street side. However, they served mostly sweet and creamy coffee. The shot was typically pulled too long so watch out. Also, the coffee was roasted very dark to punch through all those sweet and creamy milk and to save cost, ie use less coffee. One thing I never get is that HK coffee/tea culture also circulate around sweet & milky caffeinated drink in local cafe but somehow Indie not only survives but prosper. All the HK indie insist on maintaining the original taste which is similar to what I had in North America. This is what was very different from those Indies in BKK. Days, months, years pass by and these BKK Indies need to roast very dark to survive and, to me, somehow get used to the taste of dark roast and may not be able to present coffee in its best form with nuances. Thus, I am relieved El Mello come to the scene though I wonder how long it will maintain this kind of quality as they also sell dark roast house blend too. Also, almost all blends have robusta in there and most roasters feel nothing about it or have to accept it. Therefore, be careful on your coffee intake then with ton of caffeine. Nevertheless, with these new places pop up, it's time to go to Bangkok before things change. Milk drinks were roughly equal. For latte art, the HK one was full of detail, aggressive and nice in that sense though I think bkk's indie cafe trump those of HK in term of softer form. I think it has to do with the pace of life and the care to detail most Thai has. Tastewise, milk texture in HK still beat the one in Bangkok by quite a distance one can safely say they are likely to meet velvety texture and milk sweetness in HK more than BKK. This is where the difference was quite clear. 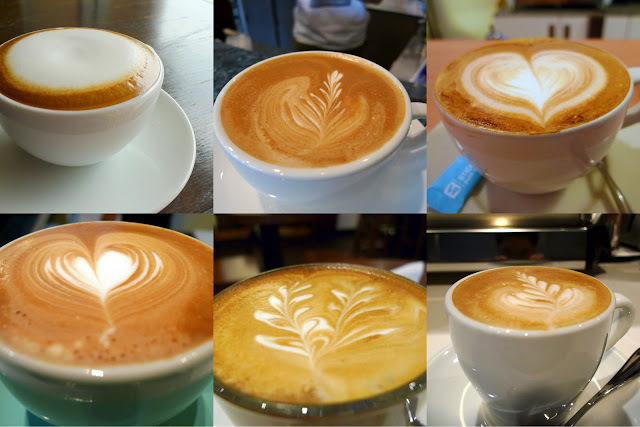 The top row is from BKK and you see lots of volume there while it indicates some blonding almost all the time, the norm among Thai's Indie cafes as if giving "as much coffee" as possible to you is the right thing to do. I remember a Thai barista said "all the parameters were set and this is the best you should try". Anyway, to ask customer how much a barista should pull is not really a great idea as barista himself should know more what good for his coffee, ie if it's shorter shot, how to pull and how to treat if it's espresso. Also, notice the overall color. The lower row on the left hand side are significantly darker despite mostly dark roast coffee in Bangkok for the rest of the cup. The first column on the left most is the exact same coffee but the top one pulled in Bangkok at its roaster and the bottom one from one of the best barista in Hong Kong, IMHO. Totally different interpretation and presentation. 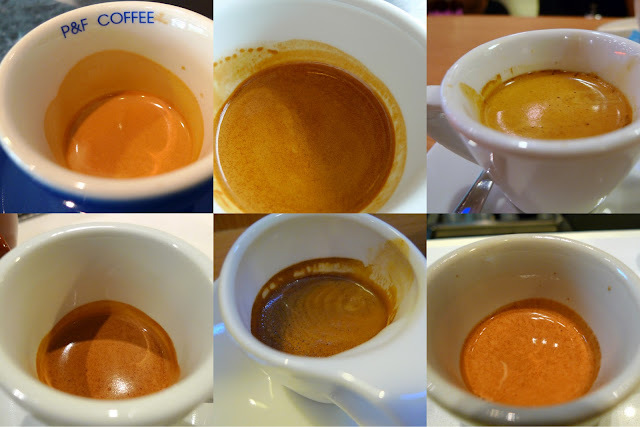 While some said you gotta taste it to know which is better, my experience with the bottom style of espresso pulling is more than 90+% of the time much better than meak/pale crema/high volume with very few exception only. Something to notice about the shot volume though this is not exact all the time. The lower right hand corner from El Mello is a wild card, ie in between BKK and HK. It has potential to be better, much better. Top (left to right): Under the "Expressway" same carpark.. and this is "Expressway" not car park..
Bottom (left to right): Who need the speed limit sign? (it said 80km/hr)... We call it Sky parking lots... and Jam,jam and jam. Small or big road, ain't matter. We can make it jam all the way!!! 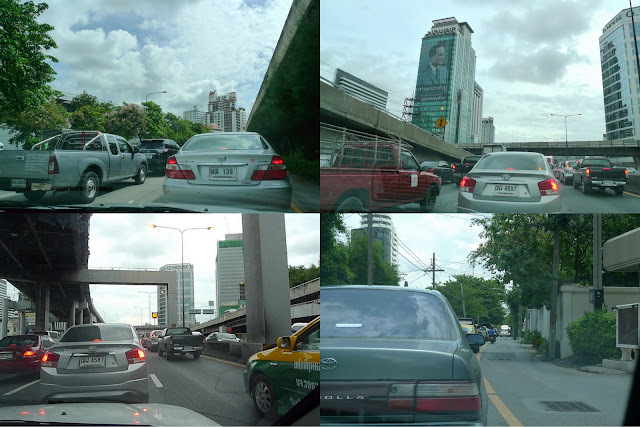 Another one I want to remind you all is the traffic in Bangkok. Everywhere is like that particularly the rush hour. Plan your trip ahead, way ahead so you can enjoy the coffee in Bangkok which seems to spread all over the place. I was so tired driving those days which may contribute to my weak taste bud at the times. I sure don't miss driving in BKK. Feel free to comment/contrast your opinion and I welcomed both positive and negative ones. 2. Gallery Drip Coffee, 1st Floor, Bangkok Art and Cultural Center (www.bacc.co.th). Tue-Sun 10am-9pm. Paper drip coffee with hand grinder - a "new" concept in Bangkok. - owner works for kopplin cafe in Minneapolis, MN before.